Chromium is a transition metal with many uses. 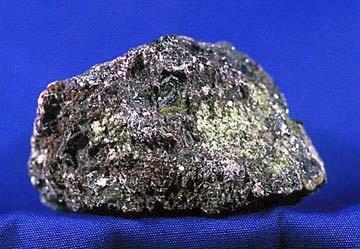 It is mined as chromite, a mix of chromium and iron, with significant deposits in South Africa and Kazakhstan. Domestic Production and Use: In 2010, the United States was expected to consume about 2% of world chromite ore production in various forms of imported materials, such as chromite ore, chromium chemicals, chromium ferroalloys, chromium metal, and stainless steel. One U.S. company mined chromite ore in Oregon. Imported chromite was consumed by one chemical firm to produce chromium chemicals. One company produced chromium metal. Stainless- and heat-resisting-steel producers were the leading consumers of ferrochromium. Superalloys require chromium. The value of chromium material consumption in 2009 was $358 million as measured by the value of net imports, excluding stainless steel, and was expected to be about $420 million in 2010. Recycling: In 2010, recycled chromium (contained in reported stainless steel scrap receipts) accounted for 44% of apparent consumption. Import Sources (2006–09): Chromium contained in chromite ore, chromium ferroalloys and metal, and stainless steel mill products and scrap: South Africa, 33%; Kazakhstan, 16%; Russia, 9%; China, 6%; and other, 36%. Depletion Allowance:6 22% (Domestic), 14% (Foreign). Government Stockpile: In fiscal year (FY) 2010, which ended on September 30, 2010, the Defense Logistics Agency, DLA Strategic Materials (formerly the Defense National Stockpile Center), reported disposals of 25,819 tons of high-carbon ferrochromium, 9,405 tons of low-carbon ferrochromium, and 151 tons of chromium metal. Disposals in the following table are estimated as the change in DLA Strategic Materials’ reported current year minus previous year physical inventory, with adjustments for accounting changes when appropriate. Metallurgical-grade chromite ore and ferrochromium silicon stocks were exhausted in FY 2002; chemical- and refractory-grade chromite ore stocks were exhausted in FY 2004. The DLA Strategic Materials announced that maximum disposal limits for FY 2011 had not been approved. Events, Trends, and Issues: Most chromite ore is converted into ferrochromium that is consumed by the metallurgical industry and most of that is consumed to make stainless and heat-resisting steel. World ingot and slab equivalent stainless and heat-resisting steel production at the end of the first half of 2010 was on track to reach 28 to 34 million tons for the year. At 28 million tons, production would be about the same as that of 2006, a year of peak production. At 34 million tons, an historically high stainless and heat-resisting steel world production would be reached. World Resources: World resources are greater than 12 billion tons of shipping-grade chromite, sufficient to meet conceivable demand for centuries. About 95% of the world’s chromium resources is geographically concentrated in Kazakhstan and southern Africa; U.S. chromium resources are mostly in the Stillwater Complex in Montana. Substitutes: Chromium has no substitute in stainless steel, the leading end use, or in superalloys, the major strategic end use. Chromium-containing scrap can substitute for ferrochromium in some metallurgical uses. eEstimated. Anglo American (OTC: AAUKY) - They own 40% of Samancor, the largest producer of ferrochrome. American Elements - http://www.americanelements.com/cr.html - Chromium metal, ferrochromium, chromium silicon alloy, ammonium dichromate, chromium chloride, chromium nitrate, chromium oxide, chromium potassium sulfate, and potassium dichromate.